Understanding A Whale Fall/Whale Watch is a store wide exhibition at Adobe Books by Carrie Hott that represents a process of inquiry, primarily into whales, with occasional tangents taken to related topics and site specific investigations. Through the representation of research and its methods, Hott makes visible the action searching and being guided by curiosity in order to orient and understand. In the back room, Understanding A Whale Fall represents an interior space that is the site for a personal ongoing investigation into whales and their history. 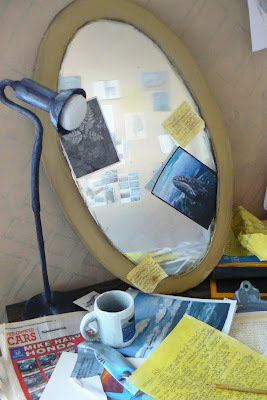 Whale Watch, in the windows of the Adobe Books Parlor, is a two-part installation and participatory project that broadens the scope of the backroom investigation and brings an additional focus onto the surrounding city and its history. The storewide exhibition nods to the communal atmosphere of Adobe Books, which draws inquisition and reflection in various forms, by visualizing the process of searching and inviting visitor contributions in the form of log recordings throughout the store. Whale Fall is the term used for a whale carcass that sinks to the ocean floor after its death. The phenomenon occurs when a whale dies in deep water, and its remains becomes the subsistence for bottom dwelling sea creatures for up to a century. That whales extend their impact and vitality beyond death for a period of up to 100 years, and provide for the most basic organisms in the ocean, is a cyclical concept that is large in scope and profound in generosity. Understanding a Whale Fall grew not only out of Hott's own ongoing interest and effort to grasp and understand whales and phenomenon such as this, but also a curiosity about a complex human history in which whales are featured prominently. As sources of myth, folklore, food, tools, light, energy, money, and fascination, whales have as much of a presence in the physical world as they often do in human imagination as heroic, mysterious, and intelligent animals. Through the installation of Understanding A Whale Fall, this action of study, as well as Hott's curiosity about the motivation to do so, was translated into a visual representation of a private, engaged, and personally motivated inquiry. The installation is meant to be specific in topic, but generally represent common tools used for human research and contemplation, such as a study room, a desk, a mirror, notebooks, and various office supplies. Through unremarkable objects, the artist intends to call attention to the study and the objects as tools for discovering and orienting oneself in both time and place. Many elements of the installation are existing found objects that are covered and masked in various materials and are painted over in order to become representations of themselves. This process is completed with the intention of creating a scene that acts as a theatrical set; objects are existing and three-dimensional but are also props and stand-ins for the entity that they represent. The first commercial whale-watching trip was launched in 1955 in San Diego, California. Passengers were charged $1 each for a chance to board the boat in the hopes of having an experience that would narrow the gap between reality and their imagination. In the Adobe Books Parlor, Whale Watch refers to the human inclination towards whale watching, and watching in general, which often elicits patience, reverence, and a sharp attentiveness, in order to allow for discovery. Within this clear objective, however, is the act of open-ended observation. As a visual and participatory project, Whale Watch is meant to echo the act of searching and orienting present in the process of Understanding A Whale Fall by concentrating on the act of observing. By bringing a focus onto the surrounding neighborhood, Whale Watch weaves aspects of the current environment and local history with the broader investigations conveyed in the backroom. Tools that aid seeing, looking, and orienting are represented in order to act as guides for visitors to the immediate geographical area, as well as the time in which they are situated. Visitors are invited to look outside the store, as well as within it, while having a heightened awareness of the devices and tools that enable us to do so. Charles Scammon, 19th century whaler turned naturalist from San Francisco, made some of the first recorded observations of marine mammals, which were initially motivated by commercial interest, but later driven by an effort to save gray whales from extinction. His recordings were published in 1874 and made into a book, Marine Mammals of the Northwestern Coast of North America, which was the first book of its kind and at the time, revealed what was once unknown about sea mammals. Whale watchers, and observers in general, consistently log sightings and observations in order to remember, recognize patterns, and make a record for those who follow. Their record of what was observed acts as a guide for subsequent watchers, studiers, and observers. In the installation Whale Watch, visitors are invited to account for their own experience and expertise in the form of records- their historical knowledge, personal narratives, book passages, advice, recommendations, recipes, hikes, etc in logbooks located in the bookstore shelves. Through a 'wanted' sign on displayed in the front window, this participation is invited from observers, watchers, and researchers of all kinds. The exhibition will conclude with a closing whale watch event that will begin with a casual walk, or land 'whale watch', in the area surrounding Adobe Books. Following the walk, a reading will take place in the store in collaboration with Invisible City Audio Tours, a Bay Area project that aims to provide alternative ways to experience urban landscapes. Among other readers TBA, the artist Carrie Hott will read, in addition to author L.J. Moore, who will read a new piece written specifically for the exhibition, and visitors can volunteer to read their log entries or other pieces. **Closing event on Saturday, November 6, 7-9pm.